Size S: Inner basket diameter 3.1". Open diameter 4.4". Inner depth 2.6". height 4.2". Size M: Inner basket diameter 3.9". Open diameter 5.2". Inner depth 3.2" . height 5.4". Size L: Inner basket diameter 5.8". Open diameter 7.1". Inner depth 3.9". height 7.8". Add simplicity and modern style to caring for your plants with this self watering planter. The fun and attractive planter is decorative and functional, thanks to the double-layer design that allows excess water to be stored in the bottom of this planter pot and provided to your plant as needed. Filling the planter with water and then lasts for days without any further attention. The self watering planter enables optimal air circulation for healthy roots. This clever planter can help you to care your plants when you go outside a couple days or on business. Self watering planter ensures the plants take enough water they need for days, and you don't have to water frequently. Up to 10 days or more of watering per fill. 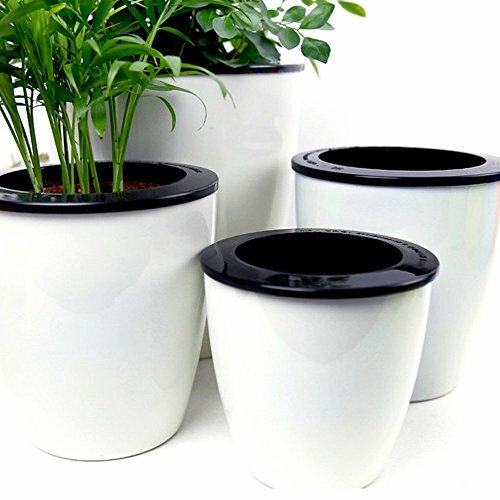 Durable, PP plastic planter, great for indoor or outdoor use. No plant includes in this item! This clever self watering planter can help you to care your plants when you go outside a couple days or on business. Thanks to the double-layer design that allows excess water to be stored in the bottom of this planter pot and provided to your plant as needed. Please note that watering the plant cannot exceed the inner basket and the water level within the flower pot is 0.4In, it will cause plant death of waterlogging otherwise. Size M:Inner basket diameter 3.9". Open diameter 5.2". Inner depth 3.2" . height 5.4". Mkono is a registered trademark and our product is professional manufacturing and sole selling.